Combine chickpea flour, water, 2tbsp olive oil, salt and garlic in a bowl. Whisk well to make sure that there are no lumps. Cover and set aside for at least 30 minutes. Turn on the broiler with the rack about 6~8" from the top. Place a 10" cast iron or oven-safe skillet in the oven to preheat. Once the oven is hot, remove the skillet out of the oven using mitts (be very careful as the skillet will be VERY HOT). Add 1tbsp olive oil and swirl the pan to evenly distribute it. Pour in the chickpea batter and return the skillet to the oven. Broil for 6~8 minutes or until the crust starts to pull away from the sides of the skillet and the edges start to brown. Remove the skillet from the oven. Turn off the broiler and turn on the oven to 450F. 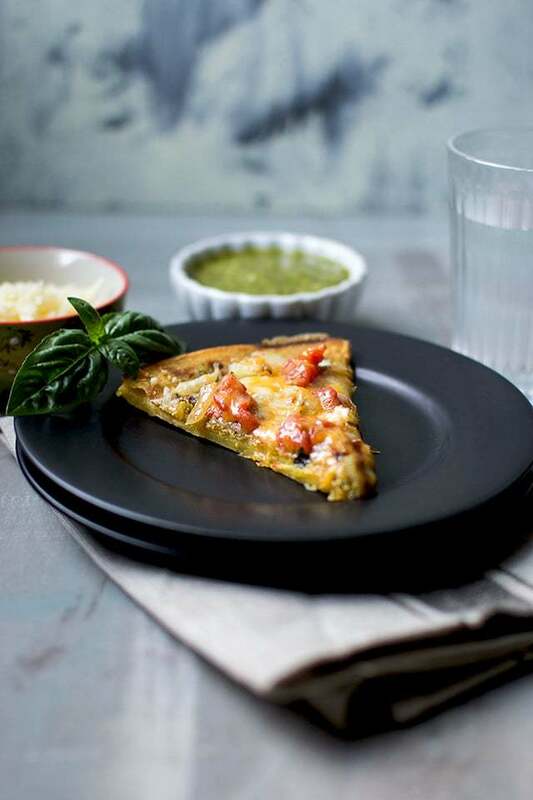 Spread the pesto on the crust and top it with chopped onion, tomato and grated cheese. Bake for another 6~8 minutes or until the cheese is melted and the crust is crisp. Remove from the oven and sprinkle the chopped basil on top. Let the pizza cool for a few minutes before slicing and serving.